The gather will tenatively begin on January 23. Has anyone requested a moratorium on all roundups given Sec. Zinke’s announcement Saturday that he will be reorganizing the DOI into different regional alignments according to common watersheds and other consideration. It is conceivable that that another agency or group could be in charge of wild horse and burro management and preservation. BLM, FBI, DOJ withheld 3,000 pp of evidence in the Cliven Bundy matter establishing how duplicitous and fundamentally dishonest BLM and others working to remove livestock and wild horses and burros from public lands have been. I know there is no sympathy for Mr. Bundy in the rank and file of wild horse and burro community, but the applicable laws (even though fraudulent in the case of the horse and in the lack of experimental science or studies on almost all of the species listed as non-native. To add to that – just possibly, if those agencies had been forthcoming & upfront – maybe, just maybe, there would have been different end results! How is there ever going to be a change in the grazing program if there are crooks on both sides?????? Or – to be really paranoid – was that the result they all wanted!!! Makes you wonder. Lucas oil and protect the harvest interfered with the case. Dave Duquette waa testifying for the Hammonds and interfering with the bundy frial. Any guesses as to why? Just the photo above alone ought to be enough to start an abuse case Against the Bureau. As well it should be brought before ethical and logical thinking judges that their environmental damages story is in fact a lie in order to fraudulently kill horses. The past 2 years shows they have attempted this propaganda however, going back 10 years they did not they have other propaganda and 10 years preceding that. The attempts to slaughter the horses are outrageous. Requesting a lowered budget, inflated costs for helicopter roundups which you have photos to prove to a judge this is abusive and stop them. A Judge will see that damage cannot be caused by wild horses as they REQUIRE much less space to survive than millions of cattle. The lies about the failure of the adoption program meanwhile BUREAU openly bragging about best adoption years ever in history! They need to open the holding pen horses to adoptions 365 days a year. I know this has upset a few advocates however, it’s time and if we do not they will most likely die. The fact is if we don’t bring about massive changes in the horses favor this American crime will be carried out. The literal millions of cattle are damaging the environment but I personally think you need a legal admission of this from the courts. The facts are wild horses Need you to get back in the media with strong words combating the propaganda regarding the environment damage. People need reminded horses are only required to have 1 acre of land per horse for personal space and that horses intake of consumables is way less than daily intake of a bred back cow calf pair grazing for 3 in gigantic herds. We need to make certain the public absolutely understands no horses are not currently starving. Your allowing them to batter that into a myth. We need to be mythbusting more adamently. The exposes to each other are great but we need to be exposing more to the public immediately. The horses are depending upon it. There’s a connection between horse slaughter plants negatively talking about horses and it will lower horse prices again if not stopped, negative talk of wild horses is encouraging black market murder for meat of horses and it’s also brought about rampant cases of horses being shot on private properties across the states. THEIR PROPAGANDA IS destructive. That’s the way ProHorse Slaughter works. Just yesterday Duquette issued a press statement claiming Protect the Harvest doesn’t want to slaughter horses. The appearance they are attempting to give now is of neutrality to work unfettered to kill horses behind the scenes. The fact is sheep in wolf’s clothing is effective….so let’s continue to pull the wool off. However the stance your taking has to leave out explicatives and let’s chip away at their foundation lie now which is horses are starving due to environmental damages they caused. Because we All know it didn’t happen. What is the source of your “one acre” per horse information? In the West this would only be a dirt pen, a recipe only for starvation in most instances. Even here in the East – one acre would not support one horse! And we have a lot more grass – pasture wise. And as you said, there is a big difference between one horse (most under 1000 lbs) and an adult cow (bred) plus a growing calf. Kind of puzzling that the BLM does not understand that!!! Guess they don’t want to, either. Christie, I have been suggesting a moratorium for a while now as it seems more important than ever not to allow a mass murder with so much in flux both nationally and locally. The gene pool has already been significantly diluted by existing practices, and it has to be considered the furthest thing from ethical management to conduct random/mass exterminations. It’s a one way exit, no turning back! If this tide continues we could and should insist that the targeted wild horse genes first be collected and securely banked for the future, with funding ensured for all related and ongoing costs. ELY—The Bureau of Land Management is seeking public review and comment on a plan to gather wild horses for up to ten years in the Seaman and White River Herd Areas, which are located southwest of Ely, Nevada, in Lincoln and Nye counties. The Wild Horse Gather Plan Preliminary Environmental Assessment is being conducted by the BLM Ely District’s Bristlecone and Caliente Field Offices, and Basin and Range National Monument and will be available for public review and comment for 30 days. The 30-day public comment period concludes Monday, Jan. 22, 2018. The BLM is proposing to gather and remove all excess wild horses in and outside herd area boundaries. The Proposed Action is needed to improve watershed health and make significant progress towards achieving range health standards recommended by the BLM’s Mojave / Southern Great Basin Resource Advisory Council. The proposed gather plan would allow for an initial gather with follow-up gathers for up to 10 years from the date of the initial gather. The plan calls for transporting gathered horses to holding facilities where they would be offered for adoption. The BLM manages wild horse populations in designated areas of public lands where they were found in 1971 and which have enough available food and water to ensure healthy horses thrive on healthy rangelands in the long-term in balance with other legal uses of the land. The Seaman and White River Herd Areas are not designated for wild horses due to insufficient forage and water resources available within the HAs to maintain healthy wild horses and rangelands over the long-term. The BLM’s decision to not manage for wild horses within the Seaman and White River HAs is based on analysis in the November 2007 Ely Proposed Resource Management Plan, Final Environmental Impact Statement. As of March 2017, the estimated wild horse population is 365, which includes foals.The Preliminary Environmental Assessment for the Seaman and White River Herd Areas Wild Horse Gather will be available online for a 30-day review period beginning on Wednesday, Dec. 20, 2017 at https://go.usa.gov/xnUwF.Hardcopies of these documents are available upon request from the Ely District. Substantive comment submission will be accepted until 4:30 p.m. Pacific Daylight Time on Monday, Jan. 22, 2018. All comments received during the public comment period will be fully considered and evaluated for preparation of the Final PEA. Questions and written comments should be directed to:Bureau of Land Management Ely District Office Attention: Ruth Thompson, Wild Horse and Burro Specialist702 N. Industrial Way, Ely, NV 89301 Comments can also be submitted electronically at blm_nv_eydo_seaman_white_river_ea@blm.gov. Email messages should include “Seaman-White River Herd Areas Wild Horse Gather” in the subject line.Commenters should be aware before including their address, phone number, email address, or other personal identifying information in their comment, that their entire comment – including identifying information – may be made available to the public. Although people can ask the BLM in their comment to withhold personal identifying information from public review, the BLM cannot guarantee that it will be able to do so. Anonymity is not allowed for submissions from organizations or businesses and from individuals identifying themselves as representatives or officials of organizations or businesses. It is my understanding that EAs have a finite lifespan much shorter than 10 years (some sites indicate only a year or so), so this extensive removal schedule should face tough scrutiny on those grounds alone. Also important to note that if approved once, they may never face public review or accountability for the next nine years if this passes as written. Legal Herd Areas, Herd Management Areas and from the Public. Rep. Dina Titus introduces her bipartisan amendment. One area in which the BLM consistently relies on old data is in its determination of AMLs. The BLM’s error in using old figures is then compounded when those calculations are applied to the periodic inventories that are made of wild horse populations in an area. BLM’s reliance on outdated inventories is illustrated by the United States General Accounting Office’s (GAO) 1990 review of the Wild Horse Program. The GAO found that a 1987 herd management plan set the wild horse target population in six Nevada herd areas at the estimated 1974 levels. 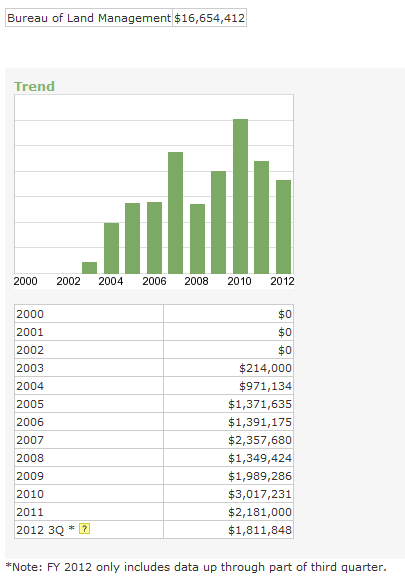 There is little indication that the BLM has improved on the quality of data upon which it relies since that time. range carrying capacity or the impact of wild horses on range conditions. accurate carrying capacity and range condition data. Many thanks for so much information, Louie. I will share it. There needs to be a lawsuit to stop this latest atrocity. My dear Corina was from the Triple B roundup when she was in foal with Heidi. Other mares lost their foals as they were chased for 14 miles. Thank YOU Barbara for all of the years that you have been helping our Wild Horses & Burros. I honestly don’t think there would be any left if it weren’t for people like you. You’re right about that, Louie. Unnatural Selection writ large here, and the timing means 250 ALREADY VERY PREGNANT MARES WILL BE TREATED WITH PZP AFTER BEING HARASSED BY HELICOPTER IN THE DEAD OF WINTER. I suppose if they abort that may be part of the population “management” intended. How is this humane or ethical, or even cost-effective, when the BLM steadfastly resists supporting citizen scientists whose darting programs have ensured all three? This still doesn’t address chasing heavily pregnant mares by helicopter, however. It’s still not clear how the pesticide, Pzp, affects the fetus. Pruitt’s waving a magic wand and declaring it safe for deer and thereby wild horses doesn’t really make it so. Nettles (1997) conducted a meta-analysis on wildlife contraceptives. He reviewed 75 studies available at that time on the subject. Among his findings regarding PZP-use across different species, including horses, were stillbirths. So, the apparent contraceptive effects of PZP may be, in part, feticidal. At least 20 pregnant mares stampeded during Antelope roundup spontaneously aborted their foals at the Bureau of Land Management’s (BLM’s) Palomino Valley Adoption Center, the American Wild Horse Preservation Campaign (AWHPC) announced today. At least three other mares have given birth to tiny foals inside the crowded pens at the holding facility in the first week since the massive capture operation in northeastern Nevada concluded on February 25, 2011. The total number of spontaneous abortions, births and deaths is yet unknown as the Antelope horses were shipped to at least four different BLM holding facilities. A video shows a newborn foal whose mother was captured recently in the Antelope roundup, meaning that she was stampeded for miles by helicopter while she was heavily pregnant. Many other Antelope mares have aborted their late term foals. AWHPC is predicting that dozens more mares will spontaneously abort their foals over the coming weeks, and many newborn foals will not survive. 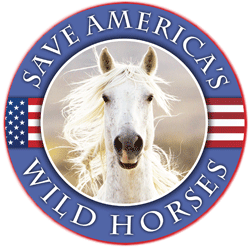 News about the continued suffering of wild horses captured in BLM roundups comes as Interior Secretary Ken Salazar and BLM Director Bob Abbey testify before Congress this week to justify a requested $12 million budget increase for the wild horse program. Last week, the BLM announced that it intends to remove an additional 15,000 mustangs from public lands over the next two years, boosting the captive holding numbers to well over 50,000 – a number that far exceeds the population of approximately 32,000 mustangs that remains in the wild. Bolbol added that it is against standard veterinary practice to transport pregnant mares near foaling time except to receive veterinary care. 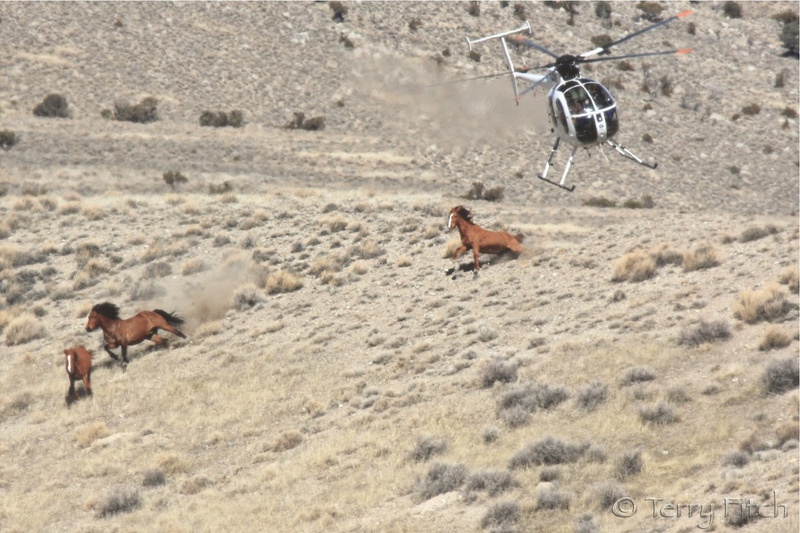 Her video of an exhausted Antelope mare who collapsed during a helicopter chase prompted a local law enforcement investigation and an admission by the BLM that agency procedures for ensuring humane treatment of mustangs need to be improved. Last year’s winter roundup in the Calico Mountains Complex in northwestern Nevada caused more than 40 mares to miscarry their late-term foals. Dr. Bruce Nock, a tenured faculty member at Washington University Medical School and an expert in the physiological effects of stress, has stated that such miscarriages are a direct result of the trauma of the roundup. “Expending resources to sustain and maintain a fetus. . . just isn’t physio–logical if it seems like you are about to die,” he wrote last year in a report for AWHPC. The BLM captured 1,368 mustangs in the Antelope roundup, just over 800 of which – mostly mares and foals – were shipped to the BLM’s Palomino Valley Center. BLM ended the roundup 500-900 horses short of its goal of removing 1,867-2,228 mustangs from this 1.3 million-acre public lands area. The agency then proceeded to ship Antelope mustangs to distant holding facilities despite philanthropist Madeleine Pickens’ offer to house captured horses on private lands adjacent to their home range, where they could become part of the Mustang Monument Eco-Sanctuary that her Saving America’s Mustangs Foundation is developing in the area. Oops, sorry for the double entries, they didn’t show when I reviewed before submitting. So who is going to lead up the fight for a moratorium? Does anyone have a clear idea how we could proceed with this? The time truly is NIGH. It is obvious these buzzards are not going to stop, and that it is up to us to kick something into gear. Many new advocates would be behind this and our presence is increasing enormously on social media, but we must get strategic. Unfortunately we do lose a lot of people because nobody really seems to be carrying the torch of truth and doing something to stop this abuse, fraud, and who knows what other forms of criminality are being perpetuated with our tax dollars. So, how do we proceed and who can we get to lead us? Wild Horse Freedom Federation spent years gathering evidence for the WHITE PAPER that we issued in July 2017, http://wildhorsefreedomfederation.org/wp-content/uploads/2017/07/White-Paper.pdf It was sent to many members of Congress. We have been at the forefront of getting the truth out to the public. But, we need donations because we can only do what we have the money to do. Yes, it’s again time to get people on social media to highlight what BLM through Zinke and the administration is doing to our wild ones.